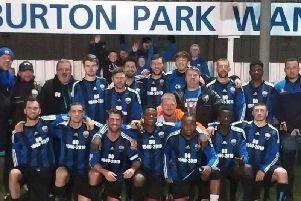 Weldon United’s title hopes in Division One of the Northants Combination remain alive and well. With leaders Blisworth Reserves in knockout action, Weldon took advantage as their 3-2 success at Woodford Wolves moved them to within eight points of top spot while they still have four games in hand. Finedon Volta moved into fourth place with a 5-2 derby success at Higham Town. Corey Beattie and Cornell Haughton both scored twice for the visitors with Ryan Knowles adding the other while Harley Villette and Sean Grigg scored the consolations for Higham. Corby Strip Mills’ Division One Cup hopes were ended as they lost 5-0 to Blisworth Reserves in their semi-final clash. Burton United have just two games left to try to salvage their Premier Division status. Burton remain bottom of the table and are two points behind second-from-bottom S&L Kingswood after they went down 3-0 at Kettering Nomads. Mark Redding, Michael Boyle-Chong and Elliot Roberts were on target for the high-flying Nomads. Desborough & Rothwell United, meanwhile, suffered a 5-2 defeat at Moulton. Corby White Hart Locos kept themselves in the promotion shake-up in Division Two after a 4-0 victory at bottom side Kettering Orchard Park. Josh Cassidy scored twice while Stephen Deegan and Macauley McBride added the others for the visitors. Elsewhere, Weldon United Reserves edged out Kettering Nomads Reserves 3-2. 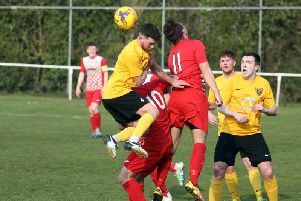 Stanwick Rovers’ Division Three title hopes suffered a major setback as they were beaten 2-1 at Irthlingborough Rangers. Goals from Jim Freeman and Blake Helsdown sealed the win for Rangers with Duncan Lawrence’s reply for Rovers proving to be in vain. Thrapston Venturas moved into third place as they thrashed Spratton Reserves 5-0. Nick Harrison and Tristan Kilby both scored twice for the hosts with Jack Pridmore adding the other. Elsewhere, Corby Siam were held to a 2-2 draw by Grendon Sapphires. Corby Trades & Labour completed their Division Four campaign with a 4-2 home success over Higham Town Reserves. Aaron Cox, Michael Girvan, Jamie McKimm and Ryan McKimm sealed the points for the hosts. Bottom side Wilby Reserves suffered another defeat as they were beaten 5-1 at home by West Haddon Reserves with Corey Beck scoring the consolation.